December 2013 – arki_lab runner-up ! Almost one year ago now, our proposal got a a runner-up prize in the Europan ideas competition. Mid-february, Jeanette and Rasmus went to Paris and met Sue, coming from Marseille, who would start her internship at arki_lab from there. We presented the proposal to Europan France and the city representatives along with other winning teams in France. We had the chance to discuss the aspects of our proposal that convinced the jury with one of the jury members ; we found out that our approach, with the idea of developing housing on the edge of the plateau and playing with a large palette of social spaces, was very different and innovative compared to the usual french way of dealing with the plateau and the bluff. This was also the occasion to meet for the first time with Marseille Rénovation Urbaine and the city of Marseille who were interested in our process-oriented approach. The spring and summer felt very long, it was waiting and calling Marseille, with a little bit of a frustration when our enthusiasm met the slowness of the procedure. Implementation processes are complex processes that are closely related to a lot of aspects (economics, regulation, social context, …) especially the political agenda. As we recognised, exchanging with other Europan teams, that is not something that happens in one week ! 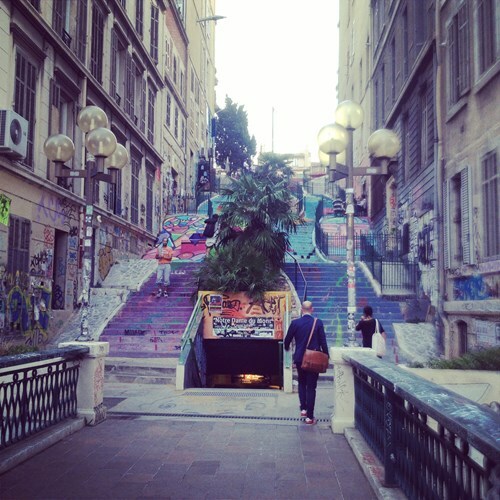 Marseille, France – Meeting with the local stakeholders and experiencing Marseille. Last week was the first formal meeting with all the local stakeholders in Marseille, including MRU and the municipality, but also two public housing organizations and the urban planning agency of Marseille. We presented the way we see the process on Plan d’Aou, emphasizing on co-creation and the importance of working in close proximity to the community, by setting up a bureau arki_lab that will allow us to be present on site. These few days in Marseille were also the occasion to experience the city and its atmosphere, being inspired by the life in the street or in squares, but also realizing that Marseille is a complex city that is very interesting to work in. It is currently in a transition period, where it has to deal with sensitive issues and at the same time embrace its own identity ; its evolution toward a metropolis leads to the growing of critical windows of opportunities in all fields of work. We were very inspired by our meetings with people from several local organizations that are actively participating in this change : Aurore from Yes We Camp, a collective that grew from a first experience of a temporary urban camp during Marseille 2013, Yann and Pierre from Synapse, a student organization bringing together students from urban planning, architecture and landscape schools to debate and involve in their environment, Margot from La Compagnie des Rêves Urbains, a non-profit organization working in the fields of co-creation through school workshops and urban walks. The project in Plan d’Aou is becoming then a very relevant piece in the puzzle. This week, arki_lab is in Italy for an intersession workshop organised by Europan Europe. We’ll present tomorrow the process that is happening in Marseille as a part of a lecture/debate on dynamic urban platforms, in the theme of the adaptable city and implementation processes. Meeting other Europan 12 and former winning teams, city representatives and scientists, we can learn from each other, elaborate and share ideas and experiences about the way we think and make our cities.